We feel proud to introduce ourselves as one of the well-known manufacturers, exporters, suppliers, importers, wholesalers and traders of Turnkey Projects. The offered turnkey projects are made to be sold as completed products to the buyer. 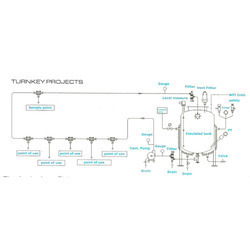 Our supplied turnkey projects are acclaimed for full proof draining mechanism, owing to the gradient in the system. The offered turnkey projects are available with seamless tubes and electro polished design.